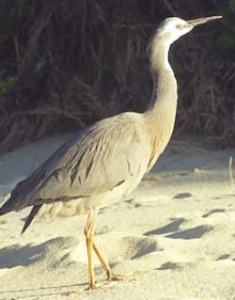 The White Faced Heron or Blue Crane is a very common species that may be seen singly, in pairs, or small groups on waterholes, swamps, and creeks. It is at home either in salt or fresh water and in winter may be seen just wandering around low lying ground or gardens in the suburbs in search of food. 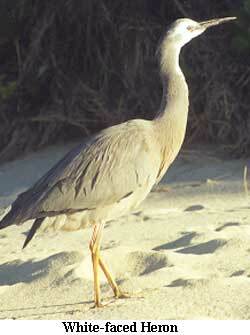 A larger bird is the White-necked Heron, ardea pacifica , which prefers fresh water lagoons and dams. The nest is a platform of sticks usually built on the horizontal limb of a eucalypt tree, quite often over water. It is rather frail and the eggs can be seen when looking up from the ground. Three or four bluish-green eggs form the clutch, and the nesting season is September to January.